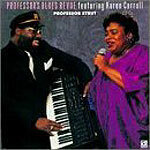 CD review: "Professor's Blue Revue Featuring Karen Carroll"
This album is nominally by Professor Eddie Lusk (a.k.a. Professor Strut. But it is guest vocalist Karen Carroll who will get your attention. With her rich, booming vocals, innate sense of rhythm, and overall musical prowess, Carroll is the best new female vocalist to hit the R&B/jazz/blues scene since Patti Cathcart (of Tuck and Patti) came to the fore a few years ago. Big claim? Perhaps. But before dismissing it as overblown critical hype, listen to "Everything Is You." True, Carroll is assisted by the Professor's always-slick keyboard work, as well as his warm singing accompaniment on many songs. Too, on this song, guitarist Joey Woolfalk alters his set-up from sounding like a watered-down Earl Klugh and achieves a bright tone more akin to Barney Kessell. And honest if the change in equipment set-up doesn't affect his playing for the better as well. But it still comes back to Carroll, and she responds with a larger-than-life performance. She also gets solo vocal duty on "I Wanna Be With You" and "You're Leaving Me." The first works nearly as well as "Everything Is You," while "Leaving" falls a little flat. As for the Professor, he seems content to lead like Basie, from behind the keyboard. He only takes one lead vocal ("Jealous Kind of Woman"), and a few keyboard solos. But what solos he does take are stupendous. On "This Little Light of Mine" (one of two vocal duets with Carroll, the other being "Come on Down to the Blues Bar"), his piano solo is top-notch. Carroll's vocal passages push him to higher levels, and one wonders why this treat was left to the last. "Professor Strut," however, fails to show off Lusk's abilities. This piece is far from the blues, and sounds instead like the yuppie "lite jazz" that has so taken over the nation's airwaves. The Professor's keyboard work on this piece is uninspired, and Woolfalk reverts to his Earl Klugh imitation. But the tunes that do work on this album work very well, and the cuts with Carroll singing justify the album by themselves.